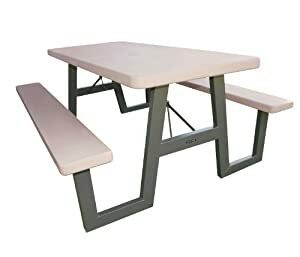 The Lifetime 6 ft. W-Frame is built with a modern take on the traditional W-frame design, the 72" x 30" high-density polyethylene tabletop is stain resistant, easy to clean and folds flat for storage. This model comes in putty with a bronze folding frame and an umbrella hole. 10-year limited warranty.